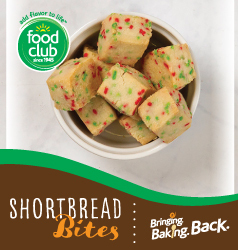 These tasty shortbread bites will make you the hit at your next party. Make it a family affair and invite your kids to throw in as many sprinkles as they’d like. Take cookie dough rolls and combine with sprinkles. Roll flat into a 8×8 cookie sheet. Refrigerate overnight until firm. Cut into cubes ½ inch squares and bake until edges are golden brown.